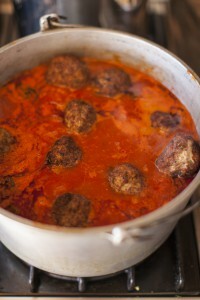 My kids laugh when I tell them, “Everything I am, I owe to the meatball.” But it’s so true, figuratively of course. My most distant memories begin standing in my grandparent’s kitchen and my Grandmom (Constance) handing out chunks of locatelli cheese as she grated it for Sunday dinner. We were not rich by any means and the cheese was expensive. So the handout was always with the warning, “Don’t tell Grandpop.” So simple a memory, yet so indelibly ingrained on my mental hard drive. 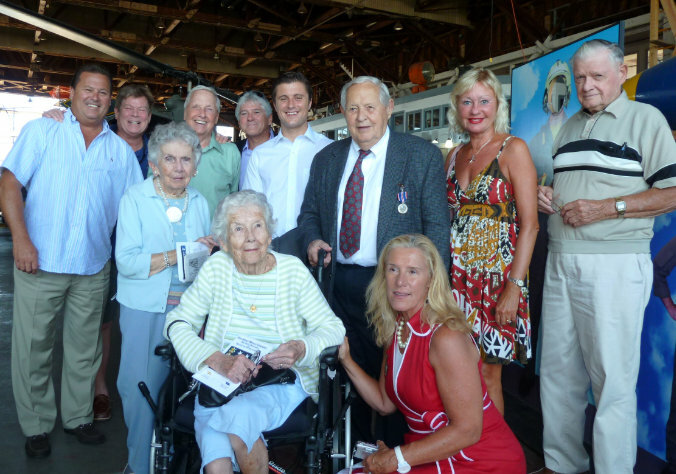 Standing at her side with my brothers and cousins as she smiled and so generously shared her most precious gift, her love of family. Sure she was a great family cook; sure the aroma of a pot of gravy simmering for hours overflowing with meatballs, sausage and braciole was enough to make us return Sunday after Sunday; but that’s not what it was about. It was about love of family. Such a simple gift from the very beginning of my life. We were fed, we were nurtured, and we were loved and it all came together at the family table. In a way, meatballs brought us together week after week, holiday after holiday, but the love being shared made us who we are. My grandparent’s basement recreation room (of course with attached kitchen and Sinatra in the background) was our center of the universe. And those magic words, “Concetta, put the water on”, meant the macaroni was on its way. I have always wanted to document for my children and extended family the simple and delicious recipes we were raised on, along with a historical biography of our family. How fortunate to have started with Grandmom and continued for the next 60 years with the gift of my mother, Joan. Although not born of Italian descent, my mother (nee Kramer), may be the best Italian family cook I know. Her unconditional love of family has always been her priority. She has instilled this priority in her children, grandchildren, and now her great grandchildren. So when I spoke to her about putting together a family cookbook to be shared with the generations, she was up to the task. Together we have assembled over a hundred recipes which are, for the most part, my mother’s catalog of the meals I was raised on; the meals my father, Pete, has been so lucky to continue to enjoy on a daily basis; and the meals my children have come to know as “Grandmom’s”. It is with this heritage in mind that I am assembling the Stampone Family Cookbook. These will be the recipes I hope to pass onto our children, teaching them the values of their parents, grandparents, aunts and uncles, and all who have gone before them. It is my hope this will allow them to understand what Italian cooking is all about, a celebration of family, and an appreciation of the heritage they are so fortunate to be a part of. Although this collection of recipes will be fondly referred to as the Stampone Family Cookbook, the contribution will extend far beyond the Stampones alone. Just as the many regions of Italy have played a vital role in Italian cuisine, so has the marriage of families. From the Rosatos, Vizzas, Lentinis, and Farrugios to the McGraths, Fosters, O’Briens, and Kramers, all will have contributed to the spirit of the collection. Many of you have asked that I continue to share recipes which previously appeared on the Stampone Law website. Over the coming months, I hope to provide a sampling for your continued enjoyment. I also hope to offer you the opportunity to make the gastronomy of our family, part of your life as well. Most importantly, I hope you will come to understand why everything I am I owe to the meatball. Buon appetito! I had the unique opportunity to be interviewed for a documentary about Roseto Pennsylvania and its historical significance related to heart disease research. My great grandfather, Nicola Rosato, was the founder of Roseto in 1887. The documentary was produced by Gabriella Flamini, a digital media student at Ryder University in Lawrenceville, NJ. The documentary chronicles the “Roseto Effect” and the almost inexplicable absence of heart disease in Roseto, the first 100% Italian borough in the United States. The vast majority of residents were immigrants from Roseto Valfortore located in the Southern Italian province of Foggia in the region of Puglia. Of note, the background music accompanying the documentary is the harmonica playing of my 86-year old father, Pete Stampone – - not only a strong heart, but a big heart. Well known author, Malcolm Gladwell, writes about the “Roseto Mystery” in the introduction to his book, Outliers: The Story of Success. Outliers debuted at No. 1 on the New York Times Bestseller List and held that position for 11 consecutive weeks. Gladwell is also known for The Tipping Point and Blink, both of which sold over $2.5 million copies. 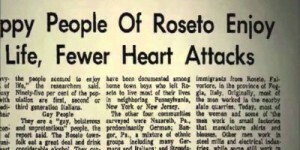 Although the focus of the documentary is the medical significance of Roseto, be sure to check out a post I wrote a few years ago called The Roseto Effect – The Valley of the Roses. In the post, I provide a historical review of the founding of Roseto, along with the medical significance of the town. Hope you enjoy it. We were so lucky to have Uncle Joe in our lives for so many years. Sadly he passed away yesterday at the age of 87. Joe was the younger brother of Julia Stampone’s father, Bill. Joe was an icon in the Philadelphia legal community. He began his career at White and Williams in 1958 and continued to work every day until his passing. He had served as the firm’s Litigation Department Chairman and was a member of its Executive Committee. He was a veteran trial lawyer who became Chancellor of the Philadelphia Bar Association in 1981. 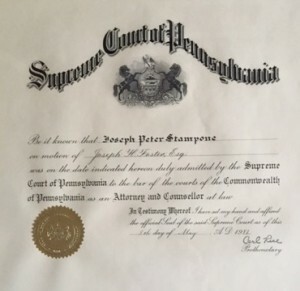 He also served as President of the Pennsylvania Defense Institute; President of the Lawyers Club of Philadelphia; and Fellow of the American College of Trial Lawyers and American Board of Trial Advocates. He was also former Vice-Chair of the Pennsylvania Supreme Court Rules Committee. But beyond his many legal accomplishments he was “Uncle Joe.” A gregarious role model, who inspired many family members to go on to the practice of law. He always showed interest in what his many nephews and nieces were doing in their lives and was truly just a nice man. No one was more respected in the family and legal community than Uncle Joe. For me, he was a mentor and friend. He personally moved me for Admission by the Supreme Court of Pennsylvania to the Bar of the Courts of Pennsylvania on May 5, 1981. He will be missed but fondly remembered.